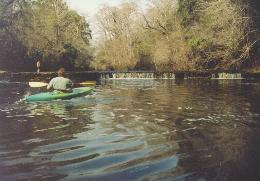 The Steinhatchee ("stein" rhymes with "bean") River is a 28-mile long river originating in the Mallory Swamp in North Central Florida and ending at the Gulf of Mexico. This river has always been a mystery to me since I moved to Florida in 1983. My impression was that it was full of history, character, and perhaps a degraded riverine quality. It turned out to be a surprisingly attractive and pleasant paddle. I have not yet researched the history, so cannot report on that. Our day begins after a number of months of a very severe drought in Florida. My hope that we could start the paddle upstream (where rivers and creeks are typically more attractive and natural) is thwarted when we drive out to the US 19 bridge—about two-thirds downstream from the origin of the river. There, we find the river so parched for water that we walk a mostly dry river bed and only a very narrow stream of water flow. We jump back in our trucks and head downstream, hoping that springs along the way would create a meaningful flow of water. We find a public access point a few miles south of the bridge on a nearby state road, and the water level is sufficient. 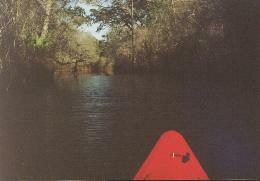 While the water level is high enough for paddling, it is obvious that it is way below normal, since there are tall, sharp vertical limestone river banks reminiscent of both the nearby Suwannee River and Ichetucknee River. The exposed limestone adds a visually eye-catching appearance to the river. The added bonus is that for most of the downstream paddle, we find the river hugged by mostly intact forest—often with large, overhanging oaks and palms over the river. The water is clear and mildly tanic brown in color, which was obvious when we paddled over white limestone river bottom. Soon after putting in, we notice a roaring sound that could be mistaken for wind in the trees. It turns out, to our surprise, that it is a Florida rarity: a waterfall. Having paddled too close to turn back (due to the strong current), we throw caution to the wind. We paddle over the falls. Fortunately, it is only a few feet high and it is enough fun to paddle through that we pull our kayaks ashore and paddle the "falls" again (see photo below right). Downstream from the falls, we enjoy seeing a pair of playful river otter pop up their heads in front of us and then swim ahead of us as they try to flee. They keep popping up their heads and looking back—frightened to see that we are still approaching them. Finally, they submerge and wait for us to pass. We spot a third otter soon afterward. This, in combination with the many Great Blue Herons we see overhead, makes for a nice wildlife encounter on the river. In the last few miles before the river enters the Gulf, there is substantial residential and dock development along the banks (mostly on the west side). Next time, when normal water levels return, we plan to start our trip further upstream and take out before reaching the developed section. After the paddle, we eat dinner in the lovely, sleepy little town of Steinhatchee at the Gulf. We eat at Fiddler's Seafood Restaurant, which I recommend. Fresh seafood, ample portions, reasonable prices. Back to Dom's Voyages and Adventures page.